Pupils from Onthank Primary attended Kilmarnock FC on Wednesday 25th February for a day of Show Racism the Red Card activities. The young people took part in workshops in the morning exploring the meaning of racism and the consequences of stereotyping. This was followed by a stadium tour with community coaches from Kilmarnock FC. During the afternoon session Show Racism the Red Card screened their anti-racism educational film, which features some of the game’s greatest players; Thierry Henry, Ryan Giggs, Rio Ferdinand and Didier Drogba. The pupils then had the opportunity to act as media journalists as part of a role play activity and posed some tough questions to a guest panel. 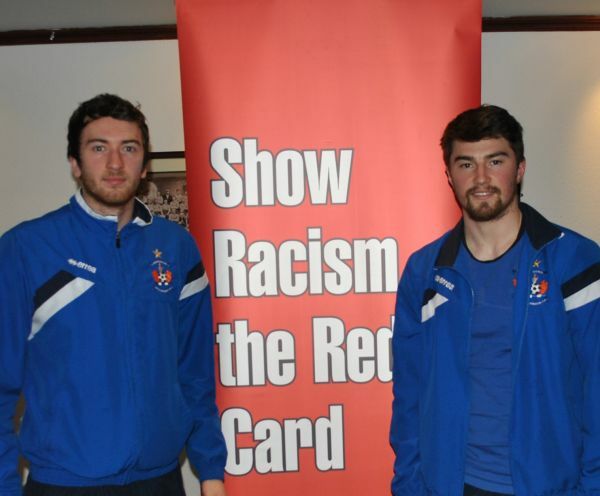 The panel included, ex-professional footballer / Show Racism the Red Card coaches Derek Ferguson and Steven Bell. Special guests from Kilmarnock FC, players Darryl Westlake and Conor Brennan joined the young people in the afternoon to take questions and share their experiences. The panel of guests helped panel to reiterate positive messages of equality and respect. Thanks to pupils and teachers from Onthank Primary and to Kilmarnock FC for a great day.